Age: 15 Height: 156cm DOB: 6/11 Fifteen years old, Lynette is the only Witch in the 501st who is native to the Britannia Federation. The middle child of eight sisters, Lynette developed very domestic and practical habits from helping to take care of her siblings. Similarly domestic is the Scottish Fold, from which her Striker-equipped animal features are based. Plagued by occasional clumsiness and sometimes overlooked, she nevertheless strives to do her best. Holds the rank of Sergeant and her affiliation is the Royal Air Force 610th Fighter Squadron. Her armaments are a Mk. I Boys Anti-tank Rifle and a Bren light machine gun. 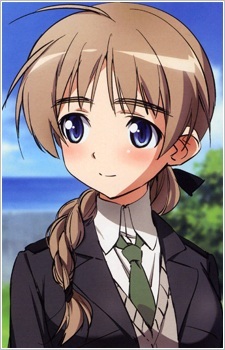 She serves as the squadron's sharpshooter and possesses an almost magical degree of eyesight similar to Mio's. Her Striker Unit is based on the Supermarine Spitfire Mk IX, and her pilot archetype is Billy Bishop. Lynette also has an older sister, Wilma, who is also a Strike Witch and likely based on Billy Bishop's son, Arthur.